How to run 2 or more trains on one track comes up from time to time. There are several ways to do it, one method even without relays. The following is the best method I have found. For 2 trains on a loop only 3 DPDT relays are required having 12 VDC or 24 VDC coils with 10 amp or more contacts. The cost for all the components to make this would be about $30. The relays are activated by the insulated outside rail method made with plastic track pins. PW tubular track would require some some alteration to accomplish this. This is not a true block system but rather a point to point operation where the train behind starts the one in front of it. A true block system would be wired so a train occupying a block stops the one behind it. Unless the layout is very large such a system is not practical. For all this to work the trains must be locked in forward only mode and a direction chosen for the loop, on this drawing counter clockwise . Another advantage of this method is that only one train runs at a time. Thus only a starter set transformer 90 watts or more would be needed and competing sound systems will not produce a cacophony of noise. Also a power source is needed for the relay coils. Shown is a separate transformer set at 10 or 18 volts depending on coil voltage. This separate transformer,not sharing a common with the track power eliminates the need for individual bridge rectifiers on each relay coil. Instead only one 10 amp or more bridge is needed. The minus of the bridge shares a common with the track power as it is also connected to the outside rail. An unused transformer tap with a built in common to the track,such as the B or C terminal on a PWZW can also be used but then each relay would need its own bridge rectifier. That method is shown in my post "How to use relays for 3 rail block detection". The following drawing shows the loop configuration and a coil circuit of the 3 relays used. There are 6 isolated center rail power blocks and 3 isolated outside insulated rails,the latter used to switch on power to the relay coils. Blocks 1,3 and 5 are as long or longer as the longest train run. Blocks 2,4 and 6 are the stopping distance required when power is removed from the train. PW trains coast and require longer distances. Usually 3 feet is sufficient for stopping a train. In the drawing relay 2 coil is energized when #2 block is occupied,the circuit being completed by the metal train wheels and axles. Likewise for corresponding outside insulated rails # 4 and #6. The drawing shows a large free running area between blocks 1 and 6,assuming this is a larger layout. On a smaller layout this free running area is not required as the end of block 6 can abut the beginning of block 1. The capacitors across each coil eliminate chatter caused by intermittent contact of the train wheels and assure smooth operation. The 1n4001 diode across each coil eliminates damaging voltage spikes generated off the coils when power is removed. 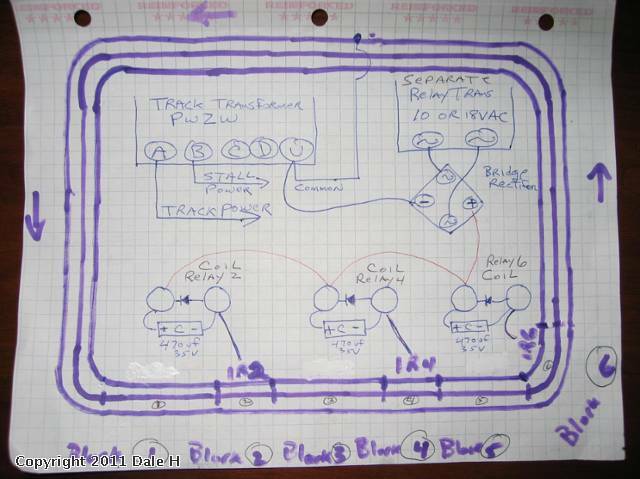 The next drawing is of the center track rail and the relay contacts. Think of them as switches activated by the relay coils when the corresponding block is occupied. C is common (common to both contacts),NO is normally open (open when the coil is not energized and closed when it is),NC is normally closed (closed when the coil is not energized,open when it is). Please Note: the previous drawing of this had the NO and Common contacts reversed on the relay, this is a corrected drawing. When block 2 is occupied block 4 receives track power. When block 4 is occupied block 6 is powered. When block 6 is occupied block 2 is powered. Then the train at block 2 goes to block 4 and stops. Then the train at 6 goes around the loop reaches block 2 and we again have trains on blocks 2 and 4 and the cycle is repeated. The right set of contacts on each relay disconnects the preceding block from the track power and connects it to whatever power the lead block has. Thus when block 2 is occupied,block 1 is disconnected from the track power and connected to block 2. When block 6 is occupied block 5 is disconnected from the track power and connected to block 6. This important function eliminates engine and trailing passenger car pickup rollers jumping adjacent blocks, resulting in repowering the stop block and illustrates the advantage of using relays with multi sets of contacts. As soon as the first two outside wheels land on outside insulated rail section 2 for example power is cut off completely to blocks 1 and 2,thus to the engine and entire train. There is no roller jumping as often found in other such circuits. Stopping time is much reduced and much more reliable. A 3rd contact set could be used if desired for switching block signal lighting. The left corner NC (normally closed) contacts can optionally be used to leave 5 or 6 volts on the block rather than completely cutting off power to it. If the engines have or are altered to have relatively the same stopping characteristics this can be accomplished. A longer stop block may be required when using this feature. This would give the motor a slight coasting effect and make stopping more realistic. The danger of course is that too much voltage would cause it to over run the stop block. Lighted trailing cars and engine headlamps would remain lighted upon stopping. With constant voltage LED lighting they would use little power and dim very little when the train is stopped. As mentioned in the beginning this is not a total block system. If a train accidentally uncoupled a collision could result. Further use of more relays could offer protection from this event. Another shortfall is that when the train is started it receives full voltage from the stop block,resulting in non prototypical starting. 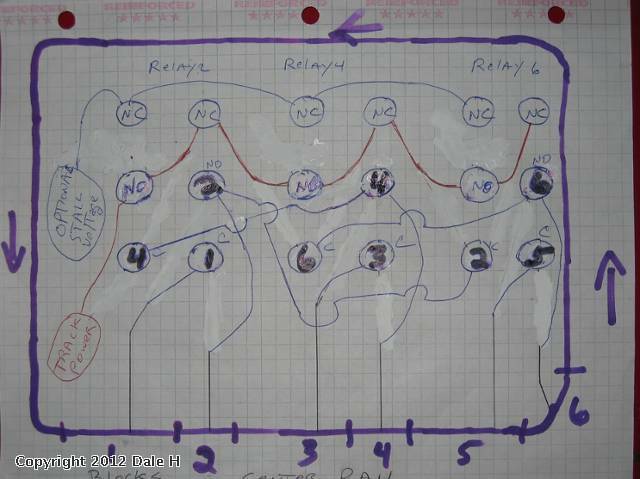 With further use of relays and timers a soft start system can be added to this basic circuit. I start my trains in 9 step increments over an adjustable set time period. There is also stopping periods between starting and stopping of trains. Automatic whistle blowing and bell ringing is also possible,but I will leave this topic to a later time. The circuit shown is for 2 trains on one track loop using 3 DPDT relays. The same type circuit using 4, 3PDT can run 3 trains on a loop. With added components and dependable turnouts added, if a long passing siding was place around blocks 1 and 6, 6 trains could be run on a loop either all in one direction or bidirectional.